Grandma's lemon meringue pie was my favorite as a kid, and now I have finally added this delicious creation to my cooking repertoire. (This is the second time I'm making this within a month.) I'm not really a religious person, but lemon meringue pie is a very Easter-appropriate dessert. Easter marks the beginning of spring, which is definitely welcomed! Lemon meringue pie takes a bit time and some effort, but it's well worth all the trouble. While you're making lemon curd anyway, make some extra - it's irresistible. Begin with the crust. Mix the flour, sugar and salt. Combine with the margarine by hand, forming a crumble. Mix the potato flour with water, and add to the dough. Mix again, mold into a ball and put in the refrigerator for ~30 minutes to rest. Meanwhile, prepare the lemon curd. Preheat the oven to 200°C. 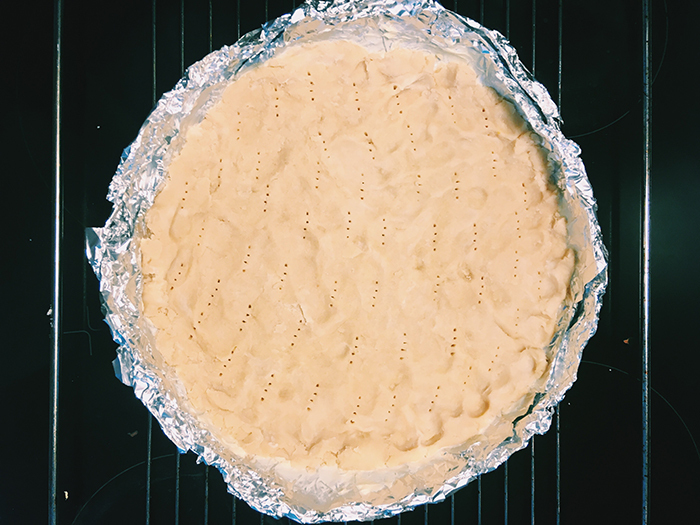 Spread some margarine on your pie tin, then spread the dough pressing by hand. Then give it a little stab with a fork before pre-baking it in the oven for 10 minutes. ... I need to get a proper pie tin. While your crust is baking, make the meringue. Use a mixer to whip the aquafaba into a foam. While mixing, add half of the sugar, then the lemon juice, and the rest of the sugar. Keep mixing until you have a shiny, thick (almost solid) foam. Take the crust out of the oven and let cool down a little. Lower the heat to 175°C. Slice the mangos or peaches. Cover the crust with a layer of lemon curd, mango or peach slices, another layer of lemon curd and lastly the meringue foam. Bake in 175°C for about 20 minutes so that the meringue gets a baked, crispy cover. I left mine in the oven for another 5 minutes after turning it off, just in case. Let the pie cool down, garnish with some lemon zest and enjoy!